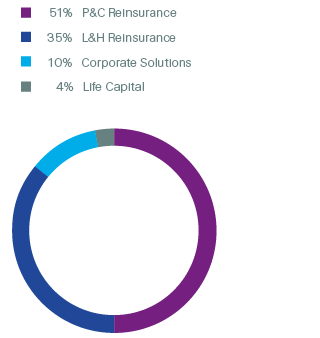 Reinsurance is Swiss Re’s largest business in terms of income, providing 86% of net premiums and fee income through two segments — Property & Casualty and Life & Health. Reinsurance aims to extend Swiss Re’s industry-leading position with disciplined underwriting, prudent portfolio management and diligent client service. At least 700 basis points greater than Swiss Re’s designated risk-free rate, currently ten-year US government bonds.